Oh, wait, I’m sharing my birthday? Right! This September 1st means I get one more year and one more book. Clockwork Menagerie, a companion novella to my Shadows of Asphodel series, comes out today. The story follows the archmage Konstantin into Russia during the bitter winter of 1914. If you know Konstantin, you won’t be surprised when he gets into trouble with technomancy, clockwork beasts, and a certain handsome airship captain. Since today happens to be a double birthday, we need cake. Myself, I’m partial to chocolate mint cake with a rich glaze, which my mom bakes upon request. Konstantin, on the other hand, lives and works in Vienna, Austria. He loves the famous sachertorte, chocolate filled with apricot, though he’s secretly the most fond of strawberry torte for his birthday cake. of his friends will buy him a gift that might literally blow up in his face. As for me, I’m pretty bad at guessing about birthday presents. I keep telling people they can always get me more books, but they point to my swaybacked bookshelves and mutter something about me having “too many,” which is obviously impossible. Konstantin would agree with me, though he tends to read more nonfiction than fiction. When is Konstantin’s birthday? That’s a secret in the books, but I’ll go ahead and tell you it’s February 13. The day before Valentine’s Day, which means blackmail material for more presents. Not that Konstantin would ever do anything so diabolical—he limits his schemes to bigger and better experiments, never mind that they often backfire. 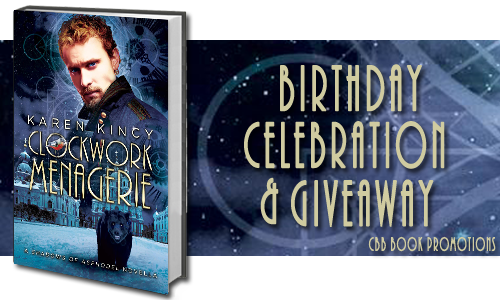 Happy birthday, Clockwork Menagerie, and go party with readers! Prizing is provided by the publisher. Hosts are not responsible. Prize is shipped directly from the etsy seller. If there is an issue a similar item may be used to replace it.